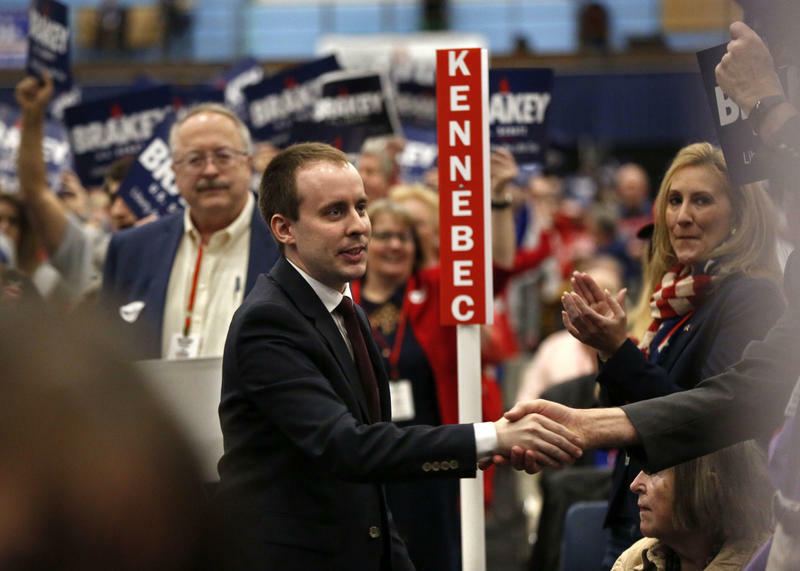 State Sen. Eric Brakey, R-Auburn, a candidate for U.S. Senate, greets supporters at the Republican Convention, Saturday, May 5, 2018, in Augusta, Maine. Independent U.S. Sen. Angus King of Maine is facing two challengers this November, and one of them is Republican Eric Brakey. The 30-year-old Auburn resident is wrapping up his second term in the Maine Senate. In his bid for the U.S. Senate, Brakey is branding himself as a new generation of Republican — one with Libertarian principles who will shrink government and champion individual freedom. Brakey recently made a campaign stop at the Medical Marijuana Caregivers of Maine’s annual Veterans Appreciation Day to stoke support among attendees and vendors. The event is friendly territory for Brakey. As a state senator for the past four years, he has been a major supporter of marijuana legalization and increased access to medical marijuana. That support has won him support from people like Brady Palmer, an independent who owns a cannabis boutique called Earthly Delights of Maine. “I like his mannerisms, he seems like he’s very ethical, very honest. I think he has the good of the people in his thoughts and his mind,” he says. Brakey also has the backing of the Medical Marijuana Caregivers of Maine, says President Catherine Lewis. He has pledged to push the federal government out of the cannabis policy arena and let states decide the issue. “On a national level, we need more voices that will speak up for that. And Sen. Brakey has proved himself here that he’ll represent the small guy and for people’s rights,” she says. Brakey says his campaign is about getting a better deal for Maine, and about more freedom and less intrusion of the federal government in people’s lives. At times, he says, those principles have leaned toward the progressive side of issues in the state legislature. “Sometimes I’ve found more support among Democrats on issues like protecting our 4th Amendment rights to privacy, on criminal justice reform, on medical cannabis, on supporting drug treatment over incarcerating people who are suffering with addiction,” he says. But at his core, Brakey is a conservative. He’s pro-life, and he believes that government exists only for some very basic purposes. “It’s essentially to protect us from each other, not to protect us from ourselves. That if one person is going to do harm to another person, then there’s a role for government to get involved,” he says. Government, says Brakey, should not restrict gun rights. He sponsored a successful state bill that now allows Mainers to carry concealed firearms without a permit. He has earned an A+ grade from the National Rifle Association, Gun Owners of Maine and the Sportsman’s Alliance of Maine. Brakey also supports welfare reform and cutting taxes. He aligns with President Donald Trump on certain issues, such as securing the border and an “America First” foreign policy. His campaign website asks for support to “drain the swamp” and give the power back to people. Schmidt says he thinks Brakey is trying to appeal to both ardent Trump supporters and conservatives who are less-so in order to attract as many votes as possible in a midterm election in which turnout is crucial. U.S. Sen. Rand Paul made a recent stop in Maine to rally support for Brakey. Speaking to Portland CBS-affiliate WGME, he praised Brakey as a liberty candidate. “Eric’s a Republican who I think will vote to restrain spending, will vote only for government that’s constitutional,” he said. It was Rand’s father, Ron Paul, who inspired Brakey to become a Libertarian. Brakey was the Maine state director for Paul’s presidential campaign in 2012. Two years later, Brakey ran for the Maine Senate and defeated the Democratic incumbent by nearly 17 points. King, the incumbent for this race, has a comfortable lead according to the latest polls, as well as strong name recognition. But Brakey hopes to pull off an upset similar that in his state Senate race, when he was just 26 years old. “The younger generation of Americans are inheriting so many of the problems of this country. From here in Maine, the lack of high-paying jobs, to the $21 trillion national debt, to just everything that’s being piled on shoulders. I think it’s about time that we get involved and make a difference and try to fix some of these problems that we’re going to be inheriting,” he says. If he does win the election, at age 30, Brakey would be the youngest senator in Congress. Originally published Oct. 9. 2018 at 3:31 p.m. ET.